I came across the White Heather LGOC CC Class - GF 7254 - 12 (ex LT 1000) posting the other day and seeing the amount of comments it received I thought you may be interested in my connection with White Heather. My grandfather Frank Thomas Brook formed the company in the 1920s and my elder brother actually drove the coach GF 7254 in the posting, unbeknown that is to Frank Thomas!. My mother was Ethel Barbara Brook who inherited Victoria Coaches on the death of my father in October 1945. I can confirm the comment in the posting is correct that Victoria Coaches consisted of a single coach and one licence. I have put together what information I have, I must say I am not a buff in any way but I think you all might enjoy my family contribution. 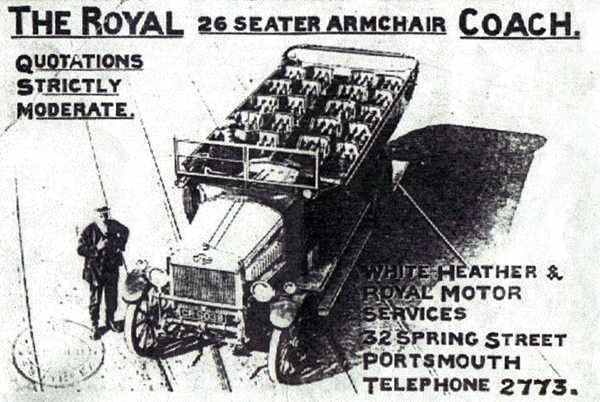 The White Heather was founded in 1920 by Frank Thomas Brook, being part The White Heather and Royal Motor Services at 23 Spring Street, Portsmouth. Tel Portsmouth 2773. From 1934-1948-1953 run from 8 "The Retreat" Elm Grove, Southsea. After Frank Thomas's death it was run from 62 Elm Grove by brothers John & Frank Hilton. On John Hiltons death in 1977 it was sold to B. S. Williams as White Heather Travel Ltd.
Victoria Coaches appeared in 1934-1940 and in 1948 was signed to Mrs E B Brook, Widow of Leonard Frank who died in 1945. Frank Hilton became a millionaire from the sale whilst Leonard Franks family made their own way in life but better people because of it. That is what I know of the history of White Heather and now I hope someone may be able to help me with a query I have. In the 1911 census about my grandfather Frank Thomas Brook he was a mechanic working for his brother William Shaw Brook listed as a coach proprietor. I know from information from my elder brother that they were running a coach service from Hythe to Folkstone/Dover. 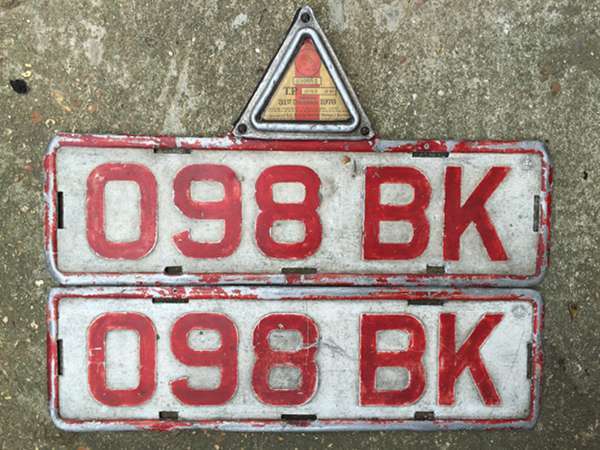 I would like to know what the company was called and any other information that maybe out there? My maternal grandfather by the way was William Thomas Gosling a coach-builder in Elham/Folkestone listed as such in the 1881/1891 census. As you can see I have quite a transport background. 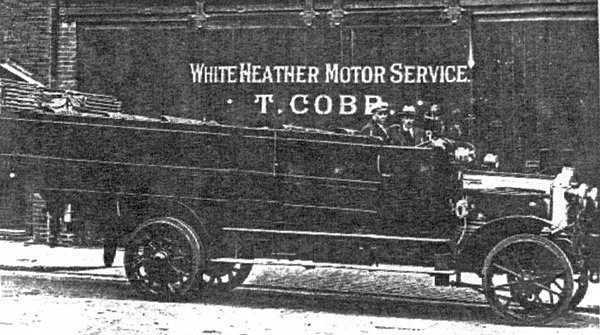 To finish I have included a few scans of early White Heather vehicles that I have, I do not have any information on any of them except that the vehicle in the White Heather advert has a registration CR 6036/8. Fascinating! Only just seen Roger Brook's contribution, presumably because I was unaware of the original name White Heather & Royal MS, later just White Heather, Southsea, and had presumed it to be a different company! Thanks for this early history. Victoria Coaches dates back to the 1920s, being acquired by the Brook family during the 1930s, as Roger states. 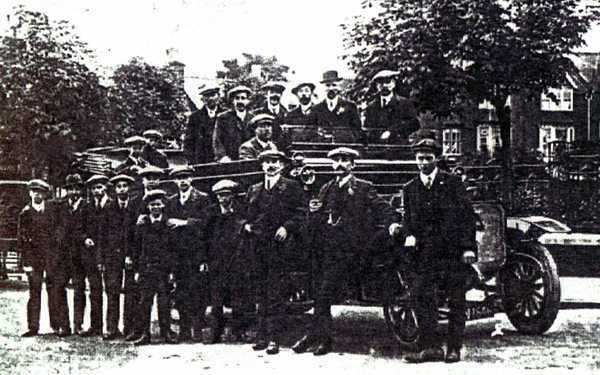 The charabanc mentioned, CR 6038, is a 1921 AEC YE with Eastbourne Aviation body acquired by White Heather & Royal MS in 1925. 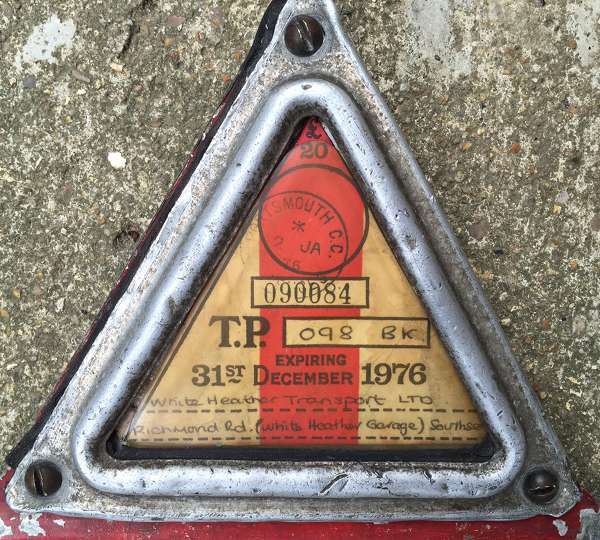 It has a Southampton registration, perhaps originally from the preceding company which ran the Hythe-Folkestone service. The White Heather garage in Richmond Road still stands. A few years ago, a minibus hire company was operating out of half of it � I believe the proprietor was a Mr Graham Brook. Fascinating stuff, which I�d not come across before, either. Spring Street, Portsmouth does not appear to exist any more, or has been renamed. I worked next door, then Telephone House, behind where the cameraman would be and recall it having White Heather above the door. The road was busy even ten and not conducive to coach parking and I never saw any parked there. As for the coach service between Hythe and Folkstone/Dover in 1911, the question is whether the service survived and for how long, before competition was too great or it was bought out. 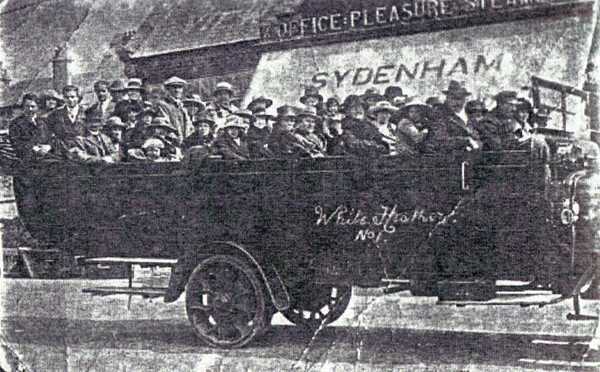 British Automobile Traction Co Ltd started operating buses in 1907 and had a presence in the area, as it began a service between Hythe and Ashford in early 1916. East Kent were big around the Hythe and Folkstone area, too, despite its name, but was not formed until 1916. The former might be a bet to find more about, the latter is not. I�d say that a service between Hythe and Folkstone would be popular at that time, since there was no direct rail service between the two. Kent County Archives might yield some useful information, but if the family name was not used on the vehicles, the odds of success are not great.